It’s not often one has the opportunity to take a look inside *someone else’s* journal and see how they record their journeys. 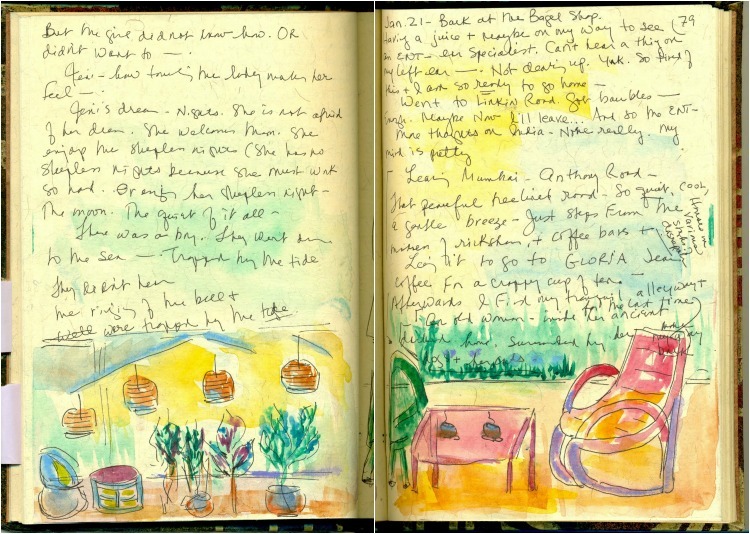 I’m so grateful to Mary Morris who’s opened some of her watercolour travel journals, created over the years, to let us take a peek and share the special opportunity her journals give her to “be utterly free and creative” when on the road. This is part of a series of interviews with travellers who offer inspirational ways of recording travel memories. I wish I could say it’s as simple as I want to record my experiences, but my travel journals are more than that. 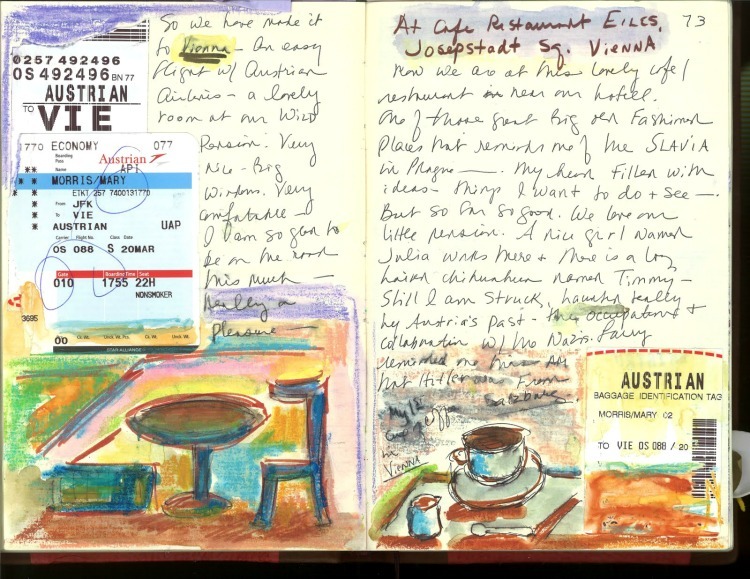 While I rarely keep a diary at home, I always have done so on the road. 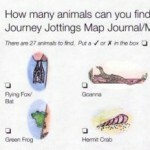 Indeed I have 62 travel journals thus far. I suppose it helps me organize my thoughts. But mainly I think that my journal is a place where I can be utterly free and creative and that pretty much only happens to me on the road. I do record what happens, experiences. 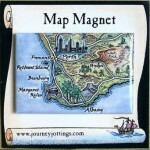 It is also the place for reflections that will often find their way into my blog. I also use it as a kind of sketchbook for my own creative writing (I write novels and short stories as well as travel narratives). And I include a lot of visuals – collage, memorabilia, watercolors, almost all boarding passes and museum tickets, etc. It is what I have done for years. I recently saw an exhibition of the journals of Leonardo da Vinci and it explained how the journals were the place where da Vinci was able to bring together his writing and his drawing. So obviously this is something that creative people have been doing for a very long time. I’ve sort of answered that above but I pretty much put everything in it. I also draw and paint. 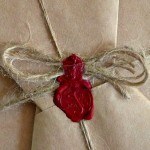 The quality of the paper is very important to me. My journals used to be lined, but now they are unlined. 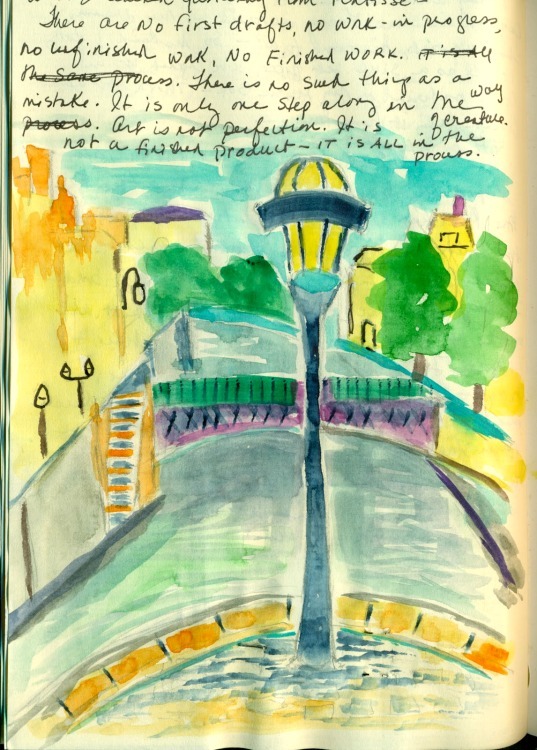 I paint watercolors almost exclusively in the journals, rarely on paper. I honestly can’t explain this, but it’s almost as if I am able to become a child again when I’m on the road and when I’m writing and drawing in my journal. One aspect of my journals that seems to interest people a lot when I give talks about my writerly life is that I create a table of contents – a kind of index in the front of every journal. Because I work on many different creative projects at once, and often will be making notes for half a dozen different projects at a time, on the contents page I put the page numbers where all the notes on a project appear. For example, I’m working on something that involves tigers so a heading might be: TIGERS, p. 3, 17, 23, 42, etc. When I get home I stick different colored Post-Its on those pages. 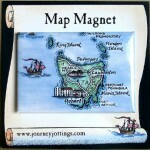 This enables me to find the material I need as I work on different things. 4. 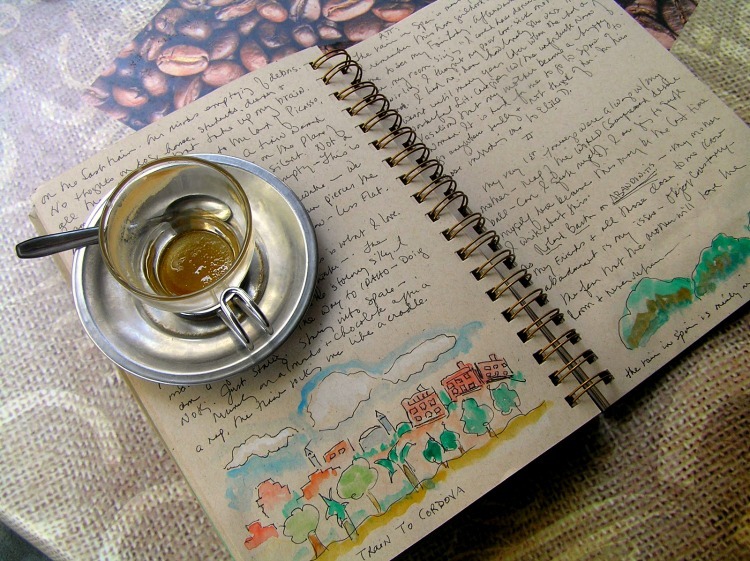 How often do you update your travel journal? On the road daily. At home rarely. When traveling, I factor journal time into my days. Some days, especially if I’m traveling with my daughter, we will sit all day and write and draw in them. We can do this for hours. I carry a very small watercolor kit and a small brush. Also I travel with a pencil case that includes waterproof pens, pencils, and, most importantly, a fresh glue stick! Always. My mind is all over the place all the time. 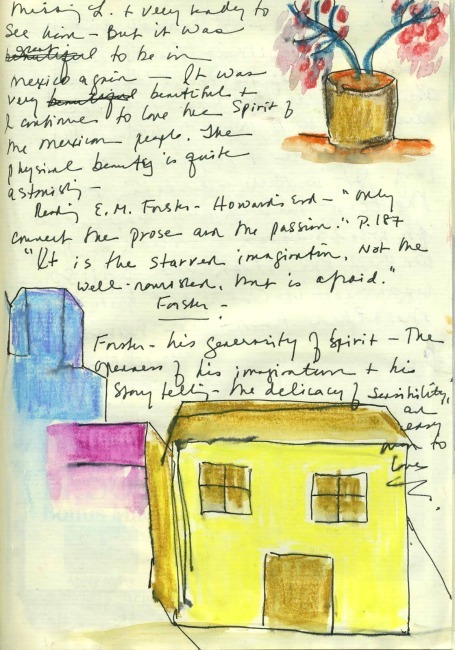 The journal focuses my thinking and, quite frankly, writing and painting in it is one of my favorite things to do in this life so I guess that in and of itself means it must work for me. no unfinished work, no finished work. It is only one step along in the way of creation. 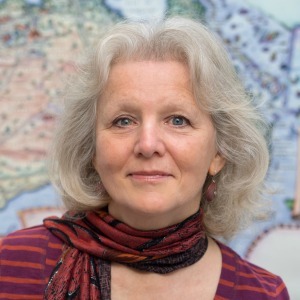 Mary Morris is a novelist and travel writer who reflects on landscapes and literature and the role that each has played in her life. 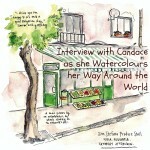 This entry was posted in Interviews with Travel Journallers and tagged doodle, travel journal, watercolour by Linda. Bookmark the permalink. Those pictures made smile. That first house looks like how I’ve drawn and painted since kindergarten. And I hope you still do Billie! It’s an art to retain our child like spontaneity and remain playful. As we get older, we become increasingly judgmental, which sadly incapacitates our freedom (enjoyment and fun) to be creative. If you have a few moments there are some interesting points here! What a beautiful journal. I love it. I will have to study the pictures and try this kind of watercolour myself. It looks so good. Thanks for sharing. I think the way the little paintings are incorporated into the text of the writing as anecdotes to her travelling tales is of course their charm. I also only journal when I travel and I just write about what I experienced on a particular day and what I was feeling. I do it so that I won’t forget anything years down the line. I like to reread them years after to give me perspective. Great post! 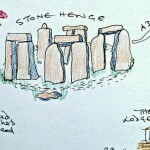 I love Mary and her watercolor journal. I first met Mary at a storytelling class in an Italian travel writers conference in Italy and instantly was amazed by her. Thanks so much for this lovely interview! The link to the storytelling class you refer is in the above text (Q3 “when I give talks“). These pictures are fantastic—and inspiring! What a great way to combine two passions. I tend to end up with a bunch of disjointed tiny little pads with my travel notes. I’d love to be organized enough to have everything in one journal—with an index no less.I have an English friend who makes gorgeous books of her travels. She even assembles the actual books herself, sewing the pages in. We’re of on a big trip soon. Maybe if I really try. …….. 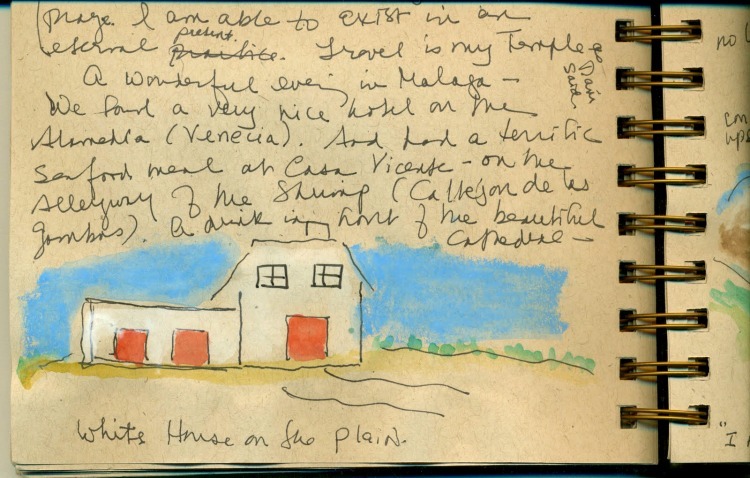 But, my book will never be as lovely as Mary’s journals. There really is something special about holding in your hand – and touching where the pen touched the paper – a journal that was on that trip with you. They really are beautiful. I so wish I could draw or paint – one day I’m going to have lessons 🙂 You’re definitely inspiring me not to give up on that dream Linda.. and thanks for sharing your journals Mary! So what’s the difference then to fearlessly flicking a paintbrush or trying a few twirls with a pen? Annabel, you don’t need lessons! I’ve never had a lesson. I can’t draw anything! I’ve just tried different things. I love color so I try to use a lot of color. Just get some supplies you like and give it a Try. Wow that is incredible. 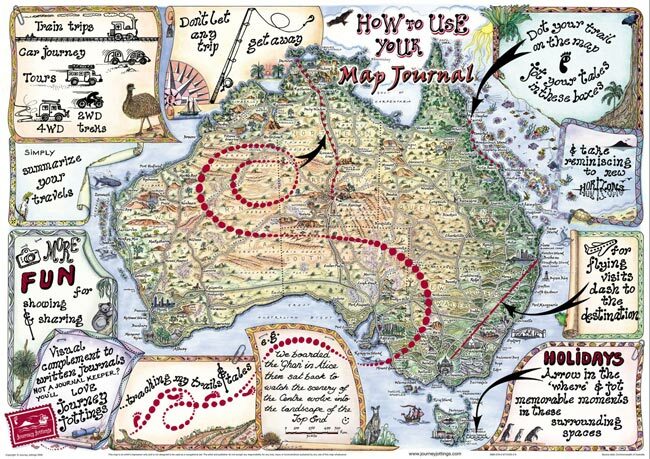 What an amazing way to keep a travel journal. I haven’t been as good about journaling the last few years as I was earlier, but I still have my first and it makes such an interesting read these days long past. Things like this inspire me to get back to doing it right. 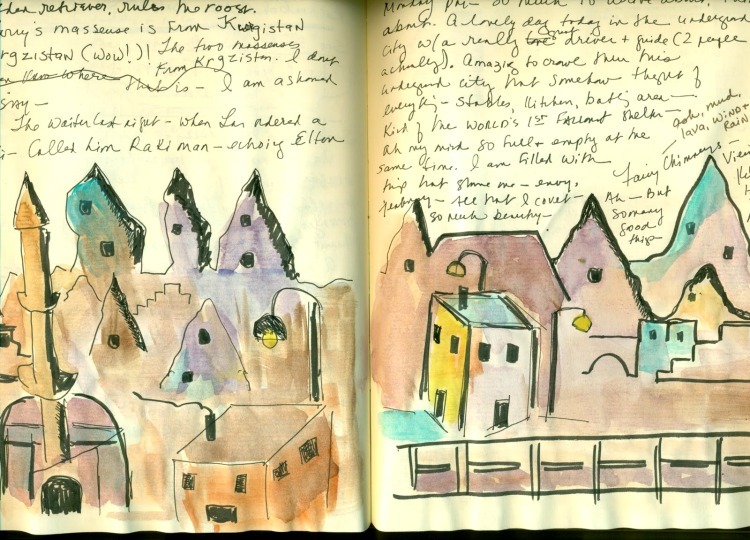 Mary’s travel journals are so wonderfully expressive aren’t they? What a wonderful way to journal. I cannot draw let alone paint, but I keep trying to get my husband to do this for me…no such luck. Beautiful! What a lovely journal. I do my painting with words but sure wish I had the talent to draw or paing. 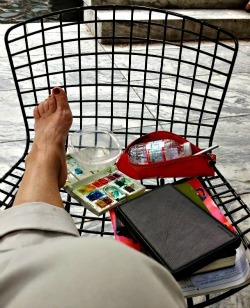 Painting with words – Now if only my words were up to that! 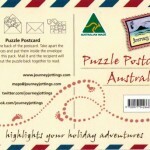 Such a lovely way to preserve travel memories – so personal. 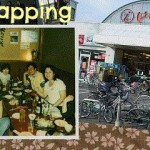 Mary, thanks for ‘opening up’ your travel journals to share with us all. I love your combination of the watercolour painting and writing. 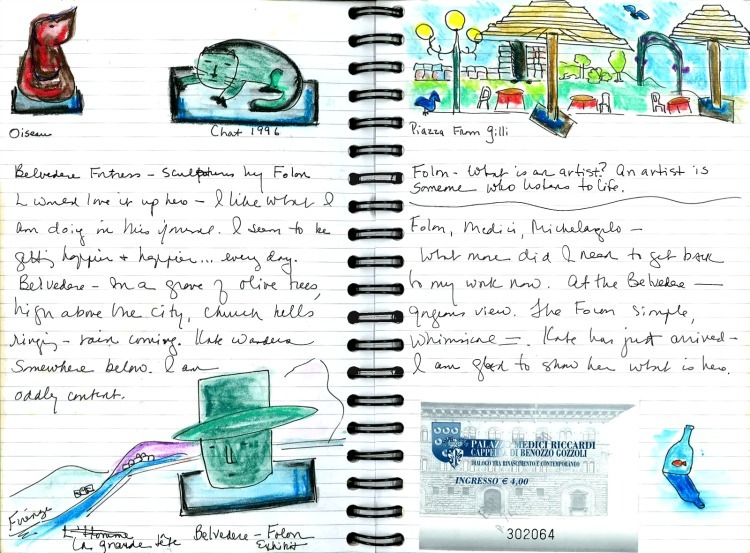 I also keep travel journals but my drawing skill is quite low so I stick with writing. A journal like this for me, is really a work of art. 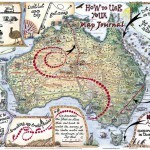 The thoughts, the artistry, the design and the layout as random as it may be for the journal maker converts to a veritable feast for the reader. Long may this form of journaling continue. I so wish I was arty enough to do this.